Power of Pop have been big fans of the RetroPop connoisseurs Obedient Wives Club ever since their debut EP back in 2012. The quintet viz. YinQi (vocals), Cherie (guitar, vocals), Man (bass), Lennat (drums) and Keith (guitar) have fashioned a unique style mixing 60s girls groups with a lighter 90s shoegaze touch, that they themselves have dubbed “Spectorgaze”. With a new EP – Cinematica – due to drop on July 14, and the second single – the gorgeous “Moonlight Rendezvous” recently being released, we felt it an appropriate time to catch up with the band and we managed to get Keith, Cherie and YinQi to answer some of our queries. It’s been a while since the last EP, Murder Kill Baby in 2013, what has the band been up to in the interim period? Keith: Being in other bands, letting life take over etc. The past year and a half have been very busy for Yinqi and myself, having gotten married, starting a home. We’re only going for our honeymoon after our first anniversary, which also coincides with the return of OWC. Cherie: I’ve been busy with my other project – noir rock duo, TOMGIRL. We’ve recorded a full-length album and released 2 singles so far. Having various members being involved in other bands – plus or minus? Keith: Definitely a plus. We can’t expect the rest to stagnate creatively just because we are busy with our lives! It also helps if each member brings in something new to the table when we work on new songs. YinQi: Absolutely a plus. Apart from the practical benefits of additional gear and instruments to play around with, each member brings onstage/backstage/music production process experience and tips from their time in Riot in Magenta, TOMGIRL and NO PANTZ. What was the songwriting process for Cinematica and how was it different from previous EPs? Keith: Very different from EP 1 & 2. The current batch of songs are almost entirely written by YinQi alone. She brings in almost songs complete, with 2 guitar lines, string arrangements etc. Post Cinemetica dynamics is looking interesting too, with the 2 songs we’re currently working on are mostly YinQi and Cherie. YinQi: Adding on to Keith’s answer, I have to tout this wonderful little app that I have on my phone that does most of the work. If a line of melody finds its way into my head, I can whip it out and “play” it into the app immediately, making it easier for me to work on additional layers and other instrumental touches later on. Was there an influence of cinema and film in the songwriting? How so? Keith: Imagery plays a very important role in our songwriting. The whole Murder Kill Baby EP was born out of a noir vision I had of a nurse assisting suicide. Throughout the writing process of Cinematica, we attached a film to each song, hence the name. That said, films play a very important role in my life. In the early days of the band, YinQi and I would rush to various film festivals post jamming. YinQi: It could be the soundtrack to the next local breakout film. Filmmakers, call us! Haha. Which movies could you imagine the songs from Cinematica could be a soundtrack to? Keith: Some Tsai Ming Liang film that has yet to be made. Although I could imagine songs like Moonlight Rendezvous being in the musical section of The Hole or Baby Bye Bye being in Wayworld Cloud. Cherie: God Help The Girl. 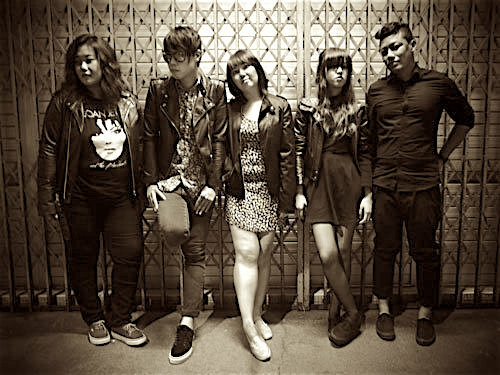 How has the Singapore music scene changed since Obedient Wives Club first appeared about 5-6 years ago? Is the scene in a better place? Cherie: I’d say the musical landscape has completely shifted. We have had so many poppin’ electronic artists coming up in the last year with such quality music. With platforms like Spotify, it’s really helped to close up that divide between Singapore and the rest of the world. YinQi: I’m no expert but it’s been very heartening to hear that local acts are being signed up to major labels – it is a sign that these big MNCs are sitting up and paying attention to what is being produced here. These young artists also bring a great deal of maturity to their work – our own Cherie included – so our music scene is definitely in good hands in the years to come.